As part of this project, we have developed an Arabic-based script for Modern South Arabian on the basis of minimal use of additional characters to facilitate the writing of texts. The choice of particular characters was adopted in part by observation of the use of Arabic in SMS-messaging and emails. See the map shows the language areas that are the focus of this project. Cartography by Ulrich Seeger. The photos in these libraries relate to cultural activities, the environment, fauna, animal husbandry, food preparation and material culture within the communities of the Modern South Arabian speakers. MSAL photos from 1970s and 1980s were taken by Miranda Morris in Dhofar or in Jiddat al-Harasis. MSAL Jiddat al-Harasis photos were taken by Domenyk Eades in 2013. MSAL Dhofar photos were taken by Janet Watson between 2010 and 2014. MSAL Mehri and Śḥerɛ̄t videos were taken by Janet Watson between 2011 and 2014. The photographs from pre-1970s were taken, unless otherwise mentioned, by unknown photographers. See Domenyk Eades' photo library of Jiddat al-Harasis 2014. What we believe to be the first children's e-book in Mehri, written by Abdullah al-Mahri and Janet Watson, can be accessed below. The second e-book, written again by Abdullah al-Mahri and Janet Watson, with voice by Abdullah al-Mahri, can be accessed below. 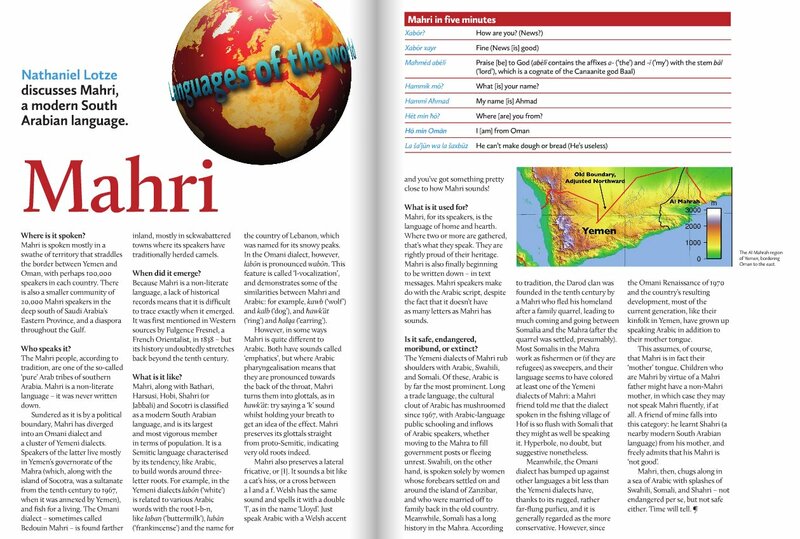 This is the first in what we hope to be a series on the adventures of Selim in Dhofar. The third e-book by Abdullah al-Mahri and Janet Watson looks at the cradle, and stars a young goat from Rabkut! View Caroline Browne's collection of photographic stills and descriptions of aspects of Modern South Arabian material culture. 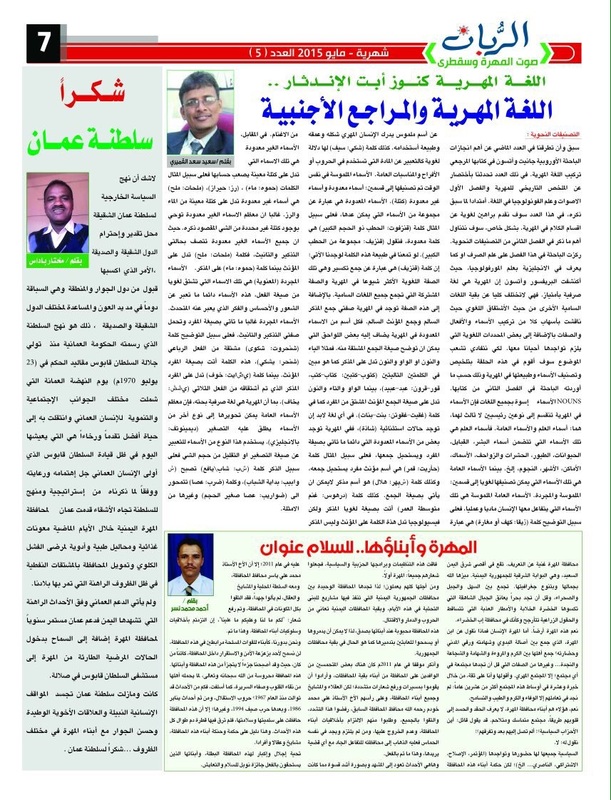 Russian roots and Yemen's Socotra language: Socotri's origins are close to the oldest written Semitic tongues that died out thousands of years ago. 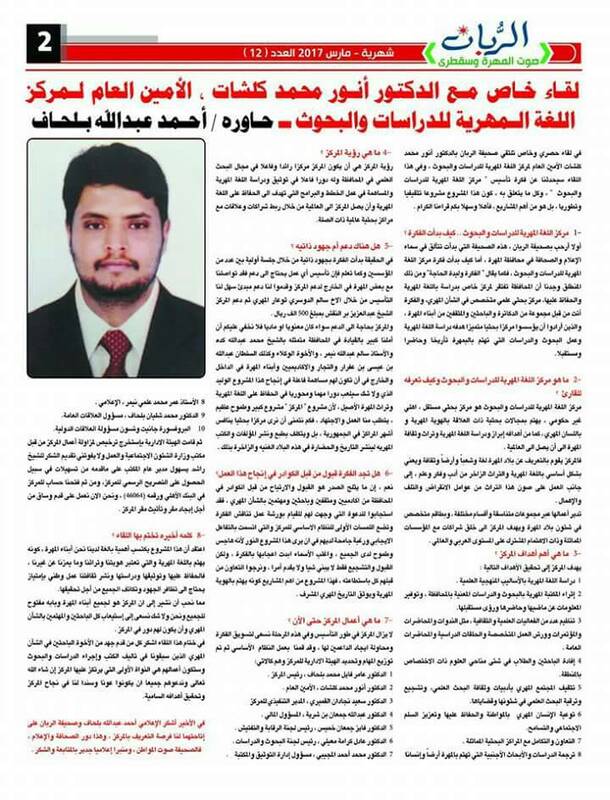 An interview with Anwar Kalshat regarding the Mehri Center for Research and Studies, in al-Ghaydha, Yemen.